When I co-founded Socialtext over five years ago, the insight was that tools emerging on the consumer web had better social dynamics than enterprise software, were a fun way to get things done and could be adapted to the context of an organization. I'm proud to finally see our partnership with Dan Bricklin come to fruition (see his post, and the history of the project) -- and the result is something truly new and solves real distributed multi-group collaboration problems. Most people play email volleyball with Excel attachments, spreadsheet hell, where its hard to work off of the latest version and error rates are as high as 90%. Recently, web spreadsheets have turned it into tetherball, but they largely are reimplementing a single worksheet on a single webpage. working with structured information in an unstructured way. Enterprise work is distributed, multi-group, often asynchronous and with varying permissions. 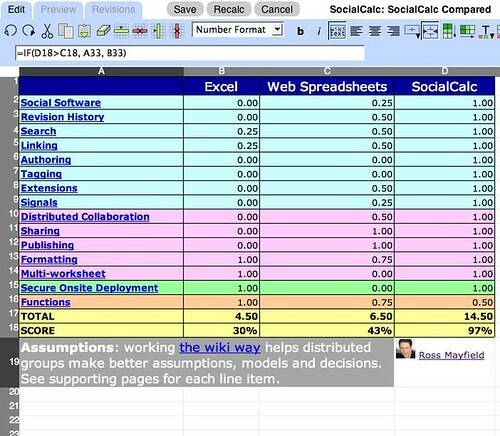 Working with SocialCalc across multiple spreadsheets, multiple pages and multiple workspaces supports distributed work. The deep integration and integrated user experience of SocialCalc and our Business Social Software platform creates capabilities even web spreadsheet plugins for wikis can't match. Distributed collaboration is essential for core use cases such as project management, planning, budgeting, forecasting, reporting and more. But in particular, it supports Socialtext's four core solution areas. I need to point out what SocialCalc should never be, function equivalent to Excel. Today it supports the ODF small group of functions. David Greenfield and Rafe Needleman see this as a weakness or a long way to go, but as Dennis Howlett points out, its a strength and we've come a long way because the approach is different. We would rather support 80% of calculation needs and focus on social software properties that give it a 10x benefit for distributed work. For some it may be the simple availability of secure onsite deployment, given enterprise policies or the uncertainty of datamining in someone else's cloud. While the latter doesn't present as great a risk, the former is not changing as fast as you think. In my last post, wrapping up the Enterprise 2.0 Conference, I made the argument that Enterprise 2.0 is just scratching the surface of process-specific solutions that are in-the-flow of daily work. SocialCalc lets people work with people and structured data in an unstructured way and is a real proof point for the potential of Enterprise 2.0. If you are interested in a demo or our private beta, contact us.